Back when we were at the height of competing, both NATRC and endurance, I used to have Mimi massaged on a frequent basis. As competitions got fewer and further between, one of the things I dropped were the massage appointments. As she’s been getting older and crunchier, I’ve been contemplating having a massage session done on her. I’d been hearing great endorsements and testimonials from some endurance friends about a massage therapist who has been at the Arizona endurance rides of late. 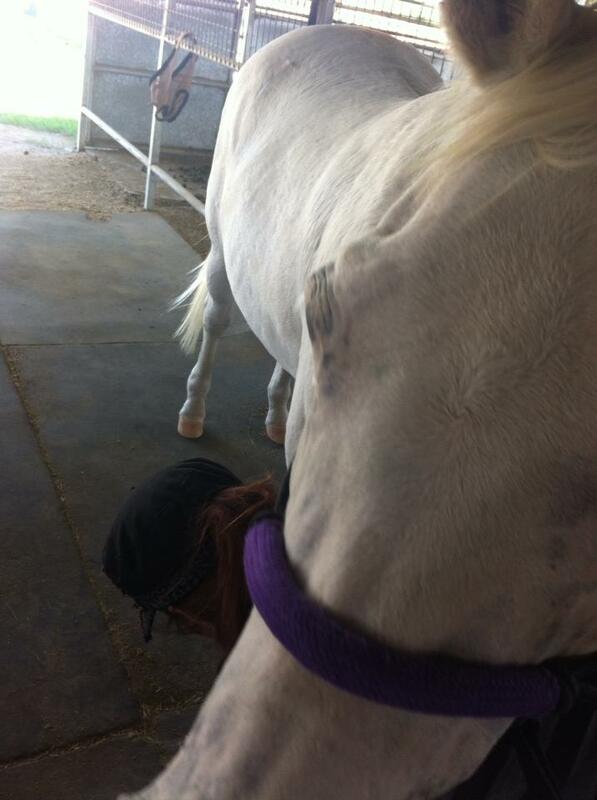 And then after Mimi got cast in her stall a couple of weeks ago, that sealed it. She had to be somewhat out of whack after that episode. I contacted Kristy at Freedom in Motion Equine Therapy (or her Facebook page) and scheduled an appointment for this morning. I cannot even begin to say enough good things about this morning’s appointment. To start, Mimi is a horse who does not readily warm up to people. It’s not that she dislikes them, she’s just pretty indifferent and can take a while to decide you are worth her time. There are very few people in this world she takes an immediate shine to. Kristy was one of them. At the end of the session, she even gave her one of her special, head-over-your-shoulder Mimi hugs. It’s really easy to understand why, though. Kristy has a great way with horses. She’s gentle and methodical in her approach and is extremely tuned in to the horse themselves, frequently talking directly to them. Mimi was definitely knotted up — a cumulative effect, I’m sure, of not only not having any work done on her for the past few years, but of things like stall kicking, running into something (probably a fence) back over the winter, and then the final straw of getting cast a couple of weeks ago. Mimi did great on giving her releases. Lots of chewing and licking, some sneezes, the passing of gas and manure. She was a bit “shy” about her releases to start — maybe because she was so knotted up, or because she was enjoying it too much to want it to stop? — but once she started loosening up, I don’t think she could help herself and she started with the licking and chewing. She’s very expressive, so after a while, she really started getting into it. Next time, I need to get more photos, because she was flat out hilarious a few times. I could see a difference in her musculature and stance as Kristy was working, and when she had me move her out afterwards, the difference was immediate and amazing. She was obviously feeling very good, as she trotted in hand after me over to the round pen, and proceeded to give me some great extensions and even slow canters for a few minutes. And when I took her back to her stall, she had her “bouncy walk” back. I cannot wait to ride her again this weekend and see how she feels under saddle. And I think we’ll be making massage sessions part of our regular horsekeeping routine again. If you’re in Arizona, I can’t recommend Kristy enough. She is based out of the East Valley, but if there is a large enough demand, she will travel to other parts of the state as well. I agree that massage therapy is wonderful – for horses and people! :) It's great that you found a good massage therapist. I hope you get a chance for a massage yourself! :) I just started getting them (my horse has gotten them for awhile), and it's made such a huge difference. I didn't realize how sore my lower back was until the massage lady started working on it. I have to admit I treat my horse a lot better than I treat myself, but the couple of massages I've had have been wonderful. I probably should make a point of doing more, since a lot of my job entails being at a desk/computer/on the phone for a good part of the day, and I can sometimes feel it in my neck and shoulders. This lady sounds incredible. Wish WV wasn't so far. Damn. Pretty freaking awesome change for Mimi it sounds! I look forward to her goofiness in photos next time haha. Yes…she felt really different (in a good way) when I rode her this weekend. I'd been wondering if she was having some saddle fit issues, but I really think she was just so tight and knotted up, that was the main cause. And speaking on saddles, congrats on your new one! Glad the long-distance purchase worked out and was a positive experience!